1958 Las Vegas. She can ruin his career. He can save her freedom. What's a little blackmail between strangers? Layla Rosas has been burned too many timesâ€”by her cheating ex, her narcissist mother, and now her father who'll put her in an asylum, for good this time, if she can't settle down and be a good girl. She needs a quality boyfriendâ€”nowâ€”to convince her dad she's back on the straight and narrow. Jace Russell is good at his job: keeping the wealthy elite who visit his casino safe and happy. When a photographer snaps a career-ending shot of a client, it's Jace's duty to do whatever it takes to stop that photo from hitting the press. Layla didn't intend to take a compromising shot, but that doesn't mean she won't use it. When Jace realizes a few fake dates are all she wants in exchange for the negatives, he's all inâ€”with the added agenda of getting the crazy but beautiful woman between his sheets. 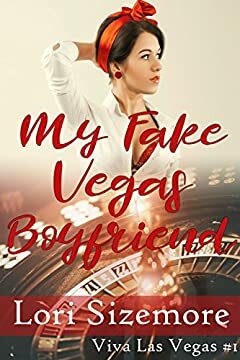 But Layla refuses to gamble her heart on the toe-curling kisses of a fake boyfriend. Itâ€™s just a few dates. How hard can it be?